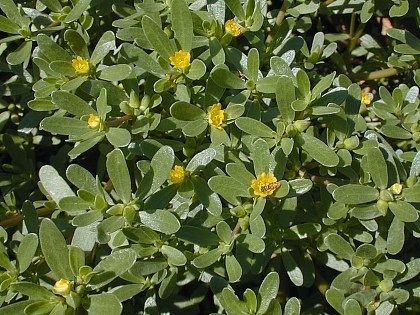 Purslane (Portulaca oleracea). Common purslane is an annual that grows rapidly in spring and summer. It thrives under dry conditions but also competes well in irrigated situations. Low growing. Leaves are very succulent and often tinged red. Small yellow flowers are born singly or in clusters of two or three. Flowers usually open only on sunny mornings. Purslane seeds are very tiny and produced in abundance. Entire plant is edible and nutritious. It really shouldn’t be treated as a weed. SEED EMERGENCE: I bet fast, but not sure. The seed are tiny. I just buy transplants or let the wild ones sprout and grow. HARVEST TIME: Harvest the foliage any time. CULTURE: Drought-tolerant and heat-loving. Not much needed to maintain a healthy crop. HARVEST AND STORAGE: Foliage and stems can be picked and eaten fresh. Pick the flowers fresh and use as garnish. NOTES: Also called moss rose and portulaca. This tasty herb is loaded with vitamin C and other vitamins and minerals. The organiphobes still recommend spraying this great food with broadleaf weed killers. The so-called weed has more food value than the hybrid flower varieties. However, both are good.